Hello, and welcome back to another slightly delayed Frightful Fridays! My friend Patrick asked for a spooky undead monster, and I hope I delivered something suitable for his purposes. The tattrered shroud is the result of a funeral shroud collecting the negative energy that animates the body it covers as an undead creature. The shroud then goes about creating more versions of that undead creature from nearby victims. It uses a surprising amount of cunning and stealth to accomplish this task. The next time a character reaches for a cloak at the inn, or pulls up the blanket that seems unnaturally chilly, it might be too late as the shroud engulfs the PC. I hope you enjoy the tattered shroud, and I'll be back next week with a new monster (hopefully, on the day for which this feature is named). Thanks for reading! The illustration for the shroud can be found here. 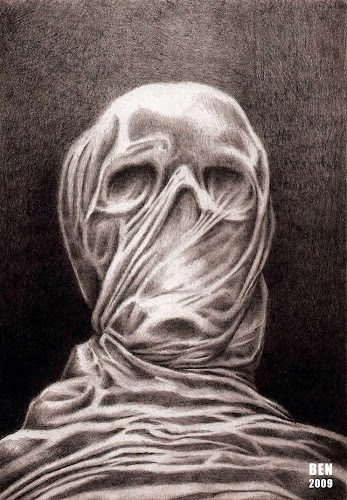 This moth-eaten, black shroud floats serenely, but an aura of menace emanates from the piece of cloth. Create Spawn (Su) A humanoid creature killed by tattered shroud becomes a free-willed ghoul in 1d4 rounds. Grab (Ex) If a tattered shroud maintains a grapple against its opponent, it deals no physical damage, but it deals 2d6 negative damage to that opponent. Attacks that hit a grappling shroud deal half their damage to the shroud and half to the grappled victim. A funerary shroud for a humanoid sometimes absorbs the negative energy surrounding the undead creature's spawning and gains an unlife of its own. The most typical example of a tattered shroud derives from a victim of ghoul fever, whom his or her family and friends bury before the victim rises as a ghoul. The shroud assumes its new existence an hour or so after the undead creature it covered. A newly created shroud seems to absorb all light around itself, generating an eerie gloom. Driven to create more ghouls, a tattered shroud flies to the nearest population center to begin its depredations. While the creature has a dim intelligence, it is clever enough to suppress its darkness spell-like ability to ensure it does not give itself away. It finds a suitable location to carry out its ruse as a cloak, bedspread, or blanket, so it can take a lone victim completely unaware. The shroud envelops its victim and will not let go until its victim dies. If the victim manages to break free, the shroud usually retargets that opponent. Ghouls too impatient to wait for their disease to fill their ranks employ known tattered shrouds to speed up the process. More powerful tattered shrouds originate from the creation of strong undead creatures, such as ghasts, vampires, and even the odd lich that has undertaken a burial service before arising. Hello, and welcome back to a late edition of Frightful Fridays! I didn't catch a bad case of con crud, so I can't use that as an excuse. Instead my day job decided it would be nice to welcome me back from GenCon with an already huge assignment that gathered requirements as the week went along. It didn't stop me from putting out a monster this week, though. Admittedly, I went the vermin route, so nothing super fancy in terms of spell-like abilities and whatnot, but check out those bolas! I hope you enjoy the giant bola beetle, and I'll be back on Friday with a new monster. Thanks for reading! Four massive chitinous orbs sprout from the top of this enormous, dark brown beetle's carapace. Speed 40 ft., burrow 20 ft., climb 30 ft.
Concussive Bolas (Ex) A giant bola beetle can fire concussive bolas up to a maximum of 30 feet. In addition to hitting an opponent for bludgeoning damage, a concussive bola can make a trip attempt that does not allow a trip attempt in return. Finally, if the beetle succeeds at a critical hit with a concussive bola, the target must attempt a DC 17 Fortitude save to avoid becoming stunned for 1d4 rounds. Success reduces this effect to dazed for 1 round. The save DC is Constitution-based. Entangling Bolas (Ex) Instead of firing a concussive bola, a giant bola beetle can shoot a detachable bola with a range increment of 30 feet (maximum range of 90 feet). This bola deals half damage on a successful strike and makes a trip attempt (with a +4 racial bonus). Additionally, an opponent struck by an entangling bola must succeed at a DC 17 Reflex save; failure causes the opponent to become entangled, while success reduces the opponent's movement to half. A flying creature struck by an entangling bola that fails the Reflex save can no longer fly and falls to the ground. An entangled creature can break free by succeeding at a DC 17 Strength check or by dealing 6 points of damage to the entangling strands with a slashing weapon. If the beetle uses an entangling bola, it loses one of its bola attacks for 1d6 rounds while it regrows a new bola. The DCs above are Constitution-based. Scourge of tropical jungles and marshes, a giant bola beetle has evolved an unusual hunting style to accompany the bola-like growths held in place by strands similar to a spider's web. It typically uses its bolas to strike at prey within reach to knock them out, after which it feeds on the still living prey. As the bola near-instantaneously returns to the beetle, it has a fair chance of tripping its target. For an escaping victim, the beetle detaches a "thrown" bola for greater range, allowing the sticky strands to immobilize the victim so the beetle can advance on it. The beetle regrows its bolas at a prodigious rate, but it shows surprising reluctance to use an entangling bola, especially against prey within range of its normal striking distance. With a successful DC 20 Heal check, a character can harvest an intact bola from a giant bola beetle. Each bola acts similarly to Large bolas (using the beetle's damage dice instead) and can entangle an opponent once before its stickiness wears off. Hello and welcome once again to a new Frightful Fridays! I'm at GenCon as this gets posted, but I got this monster done early for publication. The phantom ray evolved considerably from what I envisioned when I first saw the image. So, what was once a bog standard ghostly monster with a weird poison became a weapon against outsiders, but one that really does not want that role. Its divine purpose or engineering attracts it to outsiders, but phantom rays choose only to observe and record the creatures' activity. So, that is the phantom ray. I hope you enjoy it, and I'll be back next week with a new monster (even if I get con crud and I deliriously post another amphibian). Thanks for reading! This ghostly sting ray's long tail whips around. Visible waves of eldritch energy emanate from the creature's body. Feedback Aura (Su) At the beginning of a phantom ray's turn, every summoned creature and extraplanar outsider within the radius of its feedback aura must succeed at a DC 16 Fortitude save or take 2d6 points of damage. Additionally, any creature within the aura benefitting from ongoing spells or effects must succeed at a Fortitude save (DC 16 + highest applicable spell level) or take damage equal to the highest applicable spell level. Heartstopper Poison (Ex) Sting—injury; save Fort DC 16, frequency 1/round for 6 rounds, effect 1d3 Con and paralysis for 1 round, cure 2 consecutive saves. A phantom ray's heartstopper poison bypasses poison immunity or resistance possessed by outsiders and summoned creatures. The save DC is Constitution-based. A phantom ray claims to merely observe important events as they unfold on the Material Plane, and that may be the case now. However, the creature's array of abilities suggest that it was intended to be a weapon against extraplanar creatures of some sort—perhaps all outsiders, in order to prevent the Material Plane from becoming a massive battlefield. Strangely, the ray is an extraplanar outsider itself, deriving from an ancient aberration now adapted to the Ethereal Plane. 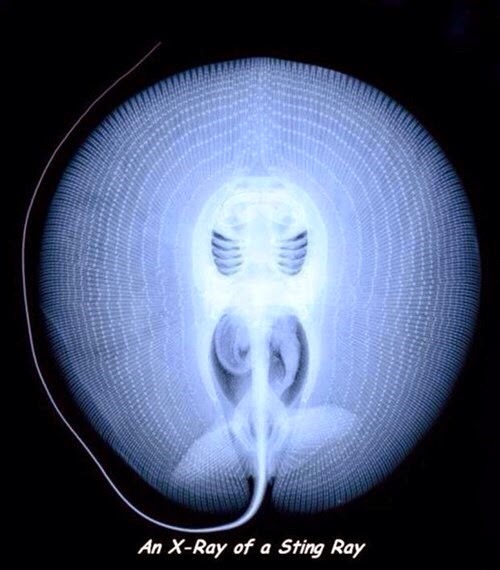 A phantom ray will only attack to defend itself, but many creatures, especially outsiders, regard its inherent feedback aura as a preemptive attack. Depending on the momentousness of an imminent extraplanar incursion, anywhere from one to a dozen phantom rays show up to observe it from a safe distance. Knowledgeable creatures realize that the appearance of phantom rays heralds the arrival of powerful angels, devils, demons, or other planar denizens. If the rays have any awareness of what is coming, they do not share that knowledge. Hello, and welcome back to a new Frightful Frogdays! I was all done with frogs, but my friend Jason presented me with a new one, and I just couldn't resist continuing the theme. This little guy is a gliding frog in the real world, but I thought it would be fun to make it an aberration with weird control over gravity, and it attacks its opponents with gravity (typically by picking them up into the air and then dropping them to their doom). It looks like he's really happy about the prospect. I hope you enjoy this week's "gravity frog." GenCon is next week, but I plan to set out a monster in advance for next Friday. I should be done with frogs and toads for the foreseeable future. Thanks for reading! The air shimmers beneath the wide, yellow-and-black webbed feet belonging to this frog-like creature. Strong Legs (Ex) A grenouille de la pesanteur's powerful legs allow it to jump while it levitates, giving it an equivalent fly speed of 30 feet. 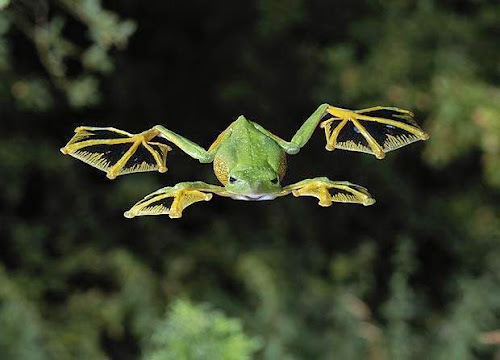 A grenouille de la pesanteur looks like nothing more than a floating frog. However, it is a strange extraterrestrial creature with control over gravity. It hunts by triggering reverse gravity on its potential meal, rising with the victim for a few seconds, and then letting the fall do the work of killing its prey. For particularly stubborn prey, a grenouille uses its tongue to grab them and carry them off before dropping them to their deaths. The grenouille prefers the flesh of intelligent humanoids, but it can subsist on any meat. In sparsely populated areas, the primary indication of a grenouille hunting ground is blood-spattered rocks. A grenouille de la pesanteur has an extremely long lifespan, which allows the creature to travel the byways between planets and solar systems. 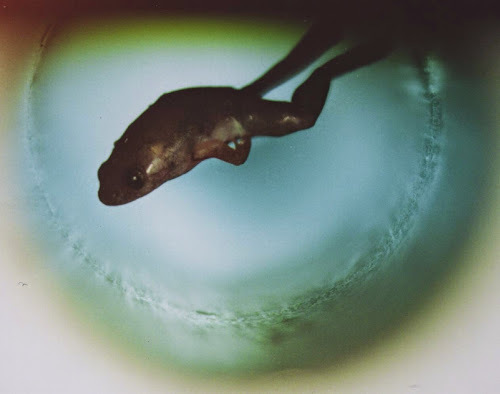 For as yet unexplained reasons, a pod of grenouille will levitate beyond the atmosphere and drift in space, where the lack of air and extreme cold cause the creatures no harm, until it reaches another planet with suitable gravity (around typical Earth gravity). Hello, and welcome back to a brand new installment of Frightful Fridays! Continuing with an evident amphibian trend (apart from last week's delightful kitten), I wanted an ooze that used a little shock and awe in its attacks. So, enter an insane wizard who hates halflings and wants something other than the ponderously slow ooze. Graft some frog DNA into the ooze, and it suddenly makes amazing leaps and engulfs those little bastards. 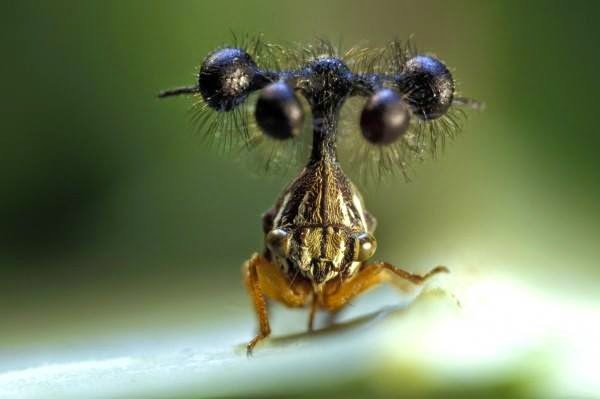 Hopefully, you have a lunatic wizard in your campaign who would dare to tamper with nature and create this thing, which will then surprise your players when it charges at one of their characters and ends its charge in an incredible leap. In the meantime, I'll be back next week with a new monster. Thanks for reading! This blocky slime holds several bones and an oddly preserved frog within its mass. Animal Intelligence (Ex) An infamous leaping ooze has a basic animal intelligence, and it treats Acrobatics, Perception, and Stealth as class skills. It retains its immunity to mind-affecting effects. Leaping Charge (Ex) An infamous leaping ooze benefits from jumping at its foes in a charge. It gains a +8 bonus on its Acrobatics check to jump when charging. Named for the location of its first sighting, the Infamous Leaping Ooze of County Cavas-Cowan (referred to as the "leaping ooze" or "infamous leaping ooze" by most people) attacked a community of halflings. It killed several solitary halflings over the course of two weeks with no trace other than a puddle of acidic slime. When it attacked a pair of halflings (one of which fled the scene), the community finally knew what threatened it. With a concerted effort, the halflings finally eradicated the ooze, but others have appeared in various locations since then. The leaping ooze is infused with frog genetics, as provided by the specially treated frog that remains relatively preserved from the ooze's acid. This infusion allows the ooze a small measure of awareness and cunning and prodigious jumping ability. Perhaps designed by a crazed wizard unhappy with an ooze's typically cumbersome movement and then unleashed upon the unsuspecting halflings at first, the ooze has appeared in other locations, indicating either the spread of its arcane design or a weird case of parallel design. A leaping ooze usually attempts to engulf one opponent on an initial charge. Afterwards, it uses Awesome Blow to turn back rescuers before it leaps away with its new meal.